For the second weekend in a row, Desperate Measures were gathering to play - this time, for a retirement party at Boringdon Golf Club in Plympton. Following early doubts about the space available for the band, we squeezed into a small hole at the end of a function room. terrible puns drive a wedge between us. Getting back to the music, all musicians know that gripping a glass is an essential finger warm-up exercise. Although we were supposed to play quietly as guests arrived, it emerged that the party was for folk involved in the medical profession who are unable to converse quietly once three or more are gathered together. Whatever level we played at, it was background music for them! After a break for some nice speeches, we returned to play some more party tunes which may not have provoked actual dancing, but certainly a lot of swaying about, nodding and foot tapping. As Brasil played football, we appropriately belted out Mas Que Nada. No need for penalties for us. Although running a bit behind schedule, we finished around 9.30 pm - an early night for us. And we were offered a visit to the buffet, which was met with enthusiasm. And we could all still get home at a reasonable hour, even if we had come a fairway. In the wild, unexplored moorland beyond the frontier with civilisation at Tavistock, a strange tribe dwells. They speak an almost unintelligible dialect, full of tales about creatures that are somehow involved in producing the smartly packaged food we find in our supermarkets. The Desperates' expedition to this secret and dangerous land was planned carefully and led by a native guide known as Teth. Following her instructions, we were directed to a remote shed where native musicians were inciting the gathered tribe into a frenzy. As we doused ourselves with insect repellent, we were handed small pieces of red parchment which is used as currency in this region, and were able to purchase bowls of local potions which proved very refreshing. After much native festivity and dancing, there were initiation processes for the tribal young who sang strange songs associated with mating ceremonies and customs. Finally we were able to play. Our introduction of our more sophisticated music was obviously unknown to the natives who danced feverishly to the new rhythms. As the midnight hour approached, we attempted to leave but were urged to stay and play more. We relented and ended with an upbeat tune that exhausted the locals and allowed us to make our exit, following the flaming torches held by our local guide to the nearby dark fields. Next Sunday lunchtime, Desperate Measures at the Bedford Hotel, Tavistock. But no! Dystonia is the name for a problem that affects many musicians - otherwise known as musician’s cramp. It can affect guitarist/bass players, pianists, clarinettists and many others. So if the audience noticed one or two glitches in today’s performance at the Bedford Hotel, they noticed the effect this problem can cause. Guitarist Dave had to rest in a couple of numbers, but the gaps he left were filled nicely by our stalwart pianist. However, when Mick the bass had a problem, Jo had to quickly reset with a rendition of the head to wrap up the tune. Such is the dedication we provide to entertain our lovely Sunday diners! In future, the band is planning to introduce some pieces that will be played by the front line only - so that the rhythm section can have a break during the two and a half hour set - which will help avoid the problem, and also make a nice contrast for the audience. The old door was at the top of a metal fire escape to the first floor. The fire escape has gone, but the door is still there, labelled “Reception”. Caused me a little confusion at first. You've probably heard about the door to the maternity ward that's marked "Push, push, PUSH!" Our esteemed leader Charlie was away this time, so Richard of tenor sax fame assumed the role of addressing the full restaurant with great aplomb. And it was good to hear some different jokes (but we missed you Charlie, honest!). The band greatly enjoyed being back at the hotel, and several members of the audience said that they had greatly enjoyed the music. And we weren’t even blocking the exit at that time. 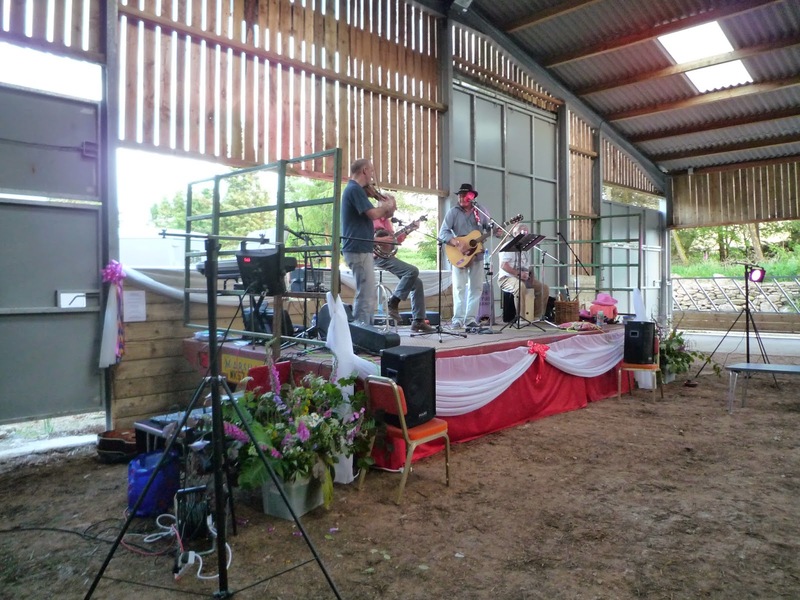 On Saturday 21 June we’ll be at Huccaby Farm Hexworthy, for Jazz in the Barn, supporting a fund raising gig for the pre-school and Widecombe primary schoool. On Sunday 20 July we’ll be at the Totnes Canoe Festival again - and a new gig this year is the Yealmpton Show on Wednesday 30th July. The later in the year, on Saturday 20th September we’ll be one of the many bands at the Morwellham Quay Beer Festival.